This entry was posted on 12th April 2019 by Life Changing Challenges. 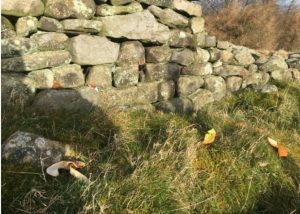 Waste food left in the hills not only looks unsightly it can attract savaging animals some of which are not normally resident species as well as enriching the existing soil as it rots, in the process damaging the delicate equilibrium of the specialised flora and forna that grow in our upland areas. I’ve often heard “Oh fruit waste is biodegradable.” A recent experiment in Snowdonia showed that orange peel takes at least 5 months and banana skins take at least 6 months to degrade. This experiment was carried out in the summer month’s at a height of under 200m. It is likely that this process would take even longer at a higher elevation, Scafell Pike is over 900m, or in a colder season. Litter left at a popular lunch spot. As humans we all produce human waste although it is often a taboo subject in relation to the outdoors. If not addressed it can lead to contamination of water courses, health issues for other walkers and can have an unsightly visual impact. Take advantage of any available toilet facilities before you arrive at the start of your walk. Public toilets in more remote locations are often not now maintain by the Local Authority but by locals. Respect these facilities and make a donation to their upkeep if possible. If you need to go when in the mountains go at least 50m from any water course or footpath. Do not go behind a wall or in a sheepfold or shelter where other may stop to shelter and eat their lunch. Toilet paper, tissues and hygiene products should be put in a zip lock bag, carried off the hill and disposed of appropriately. 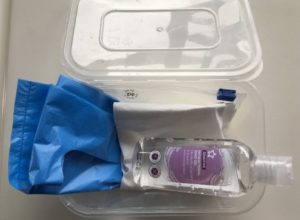 A small plastic re-sealable box containing toilet paper, zip lock bag, nappy or poo bags and hand sanitizer is a good addition to your rucksack kit. Some of us love to take our dogs with us into the mountains. The same rules that apply to us should apply to them in respect of the environment. Try and pick up their waste in a dog poo bag, carry it off the hill and dispose of appropriately. 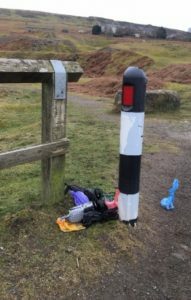 Please dispose of your rubbish appropriately when off the hill. Not everyone does. I hope the majority of you reading this blog will already be following these rules but what about other people’s rubbish. There are not many days I go into the hills without bringing down someone else’s discarded plastic bottles. If you want to take it further why not join an organised clean up event. 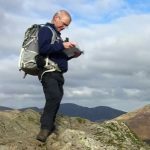 Life Changing Challenges run a Scafell Pike Double Eco Challenge where you can also raise money for charity. The Real3Peaks is an annual clean up event which started as a way to clean up of the National 3 Peaks but has now spread to other mountains.